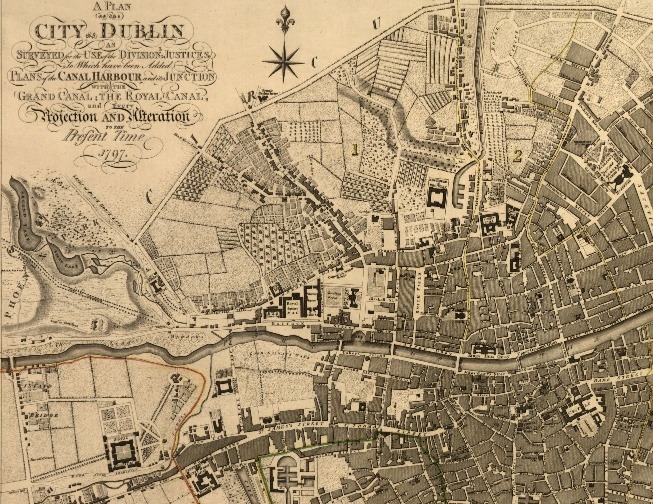 Section of a 1797 map of Dublin. The full map is here and quite a lot larger. Trinity College Dublin have published the Down Survey maps based from the survey done in 1656-1658. The Down Survey of Ireland is the first ever detailed land survey on a national scale anywhere in the world. The website includes digital images of all the surviving Down Survey maps at parish, barony and county level, together with written descriptions of each barony and parish in the Down Survey Maps section. The Historical GIS section brings together the maps and related sources in a Geographical Information System (GIS), relating the Down Survey maps to 19th-century Ordnance Survey maps, Google Maps and satellite imagery. Other maps are available on roots.swilson.info, including the John Speed maps from 1610.